Image by Radio Zapatista (radiozapatista.org). On October 14, the National Indigenous Congress (CNI) and the Zapatista Army of National Liberation (EZLN) issued a communiqué entitled “May the Earth Tremble at Its Core.” The communiqué has the merit of centering attention on struggles in defense of land, forests, water, and all that is threatened by large-scale development projects and the dispossession of common resources. It also represents a call to society to organize in support of a new political initiative that would lead to the selection of an Indigenous woman, a delegate of the CNI, as an independent candidate in the presidential elections in Mexico in 2018. The communiqué was issued at the end of the Fifth National Indigenous Congress, held at CIDECI-Unitierra, in San Cristobal de Las Casas, Chiapas, which marked the 20th anniversary of the CNI and another anniversary of Indigenous resistance to conquest and colonization over the past five centuries. The CNI continues to be an expression of hope for change and a new Mexico, despite the government’s failure to implement the San Andrés Accords on Indigenous Rights and Culture, signed in 1996 between the EZLN and the Mexican government. Struggles to resist the current economic model have continued and involve the difficult construction and defense of autonomous spaces by Indigenous groups who now form the social base of support behind this new joint initiative. Although the proposal of the CNI and Zapatistas is rooted in these experiences of struggle, it is not limited to demands of Indigenous peoples but also includes civil society more broadly. The novelty of the initiative is that it proposes another perspective on national politics in Mexico—that is, it is an invitation to rethink the nation from the experiences of those who resist dispossession and repression in the countryside and in the cities. The proposal does not seek to win power (in the sense of exercising public office within the existing institutions of the state) but rather to build a more solid, connected, and national defense against large-scale development projects and dispossession throughout the country. The proposal is also different from other experiences in Latin America in which Indigenous peoples who decided to participate in the electoral arena in alliance with political parties have not seen favorable results. In Ecuador, for example, in the mid-1990s, the Coordinating Council of Indigenous Nationalities of Ecuador (CONAIE) decided to participate in the elections, taking advantage of an electoral reform passed in 1994 that allowed independent organizations to run candidates and removed a previous law requiring registration of members in at least 10 provinces and registration of candidates in at least 12 provinces. In this new context, CONAIE decided to form a political party, known as the Pachakutik Plurinational Unity Movement (MUPP), which participated in alliances with other parties to remove corrupt presidents, winning spaces in the government led by Lucio Gutiérrez in 2002. However, Pachakutik ended up being marginalized by this same government, which, once elected, decided to implement austerity policies and other anti-popular measures that led to the resignation or firing of Pachakutik’s representatives from the administration. This situation had a negative impact on the Indigenous movement and led to a revaluing of local and community-based organization as opposed to strategic alliances with candidates of national political parties who tend to impose their own agendas, as happened with the government of Rafael Correa. A similar process has occurred in Bolivia, where the rise of the Movement Towards Socialism (MAS) as a political party, which was based in large part on the mobilization of Indigenous peoples, has led to several tensions and contradictions between the impetus given by the MAS governments to extractive industry and the resistance to this model due to its harmful effects on autonomy and environment in Indigenous territories. 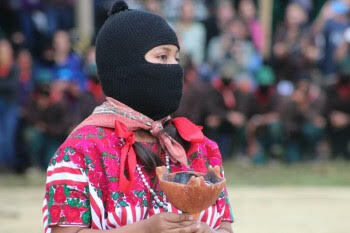 In the case of Mexico, the new initiative of the CNI and EZLN does not include the formation of a political party or alliances with existing parties, but rather the creation of an Indigenous Governing Council and the promotion of its proposals through an Indigenous woman, a delegate of the CNI, as an independent candidate in 2018. It is an initiative that seeks to ensure a close relationship between the candidate and the communities represented by the council, one that would avoid cooptation. It is a different approach to the political dilemma of how a popular movement can gain national presence without losing ties to its social base of support. As we may expect, the proposal will compete with those of other candidates and their parties, which could end up in mutual disqualifications among different opposition groups or in a necessary debate over the direction that Mexico should take and the role of Indigenous peoples, communities, and neighborhoods in defining this direction. We do not know yet what reception the proposal will receive. For the moment, we can say that the initiative ensures that the problems of dispossession, impunity, violence, and repression expressed by the CNI and EZLN will be unavoidable topics for national debate and, for this very fact, constitutes a timely and welcome contribution. * Neil Harvey (nharvey@nmsu.edu) is a professor and head of the Department of Government, New Mexico State University. He has conducted research on rural social movements, the Zapatistas and political change in Mexico, including the book The Chiapas Rebellion: The Struggle for Land and Democracy (Duke University Press, 1998). This article is a translated and edited version of “CNI, EZLN y el poder de abajo,” La Jornada (Mexico), October 17, 2016.